Orland, CA – January 22, 2008 – Farm Sanctuary, the nation’s leading farm animal protection organization, will welcome Cupid—a formerly slaughter-bound calf—to its 300-acre shelter in Orland, CA this afternoon. After falling from a truck near Turlock, the young male Holstein took cover in an orchard, where he was discovered by Merced County Animal Control last Friday. Cupid will be transported to Orland today by the Santa Cruz SPCA. Cupid was one of several calves who reportedly fell onto Highway 99 on Thursday, January 17. California Highway Patrol (CHP) and Merced County Animal Control officers called to the incident site near Turlock found no trace of the animals and believed they were hit or claimed by their owner. The following day, animal control located a calf—Cupid—in an orchard off of the freeway. Upon entering the orchard, an agency officer was immediately greeted by the bellowing, starving animal. From the USDA identification tag on Cupid’s ear, animal control officials determined that he was recently acquired at the nearby Turlock Livestock Auction Yard, which held a sale last Thursday. Cupid’s final destination remains a mystery, but Merced Co. Animal Control workers believe he would have been slaughtered for veal—a fate common among male dairy calves who are of no use to the industry. Farm Sanctuary’s Orland shelter—located in the middle of California dairy country—has a long history of caring for fragile, motherless calves. Since opening their barn doors in 1993, the west coast sanctuary has taken in nearly 100 cattle, approximately 73 of them under the age of one year. Whether abandoned at stockyards or discovered alive on rendering trucks or dairy farm dead piles, the majority of these fragile animals require closely-monitored care and rehabilitation—Cupid will be no different. Cupid is stable at this time. The calf is malnourished, but according to SPCA staff, he is eating heartily and does not appear to suffer from any injuries. Upon arrival at Farm Sanctuary, Cupid will take up residence in the shelter hospital, where he’ll be fully assessed by a veterinarian. When he is weaned, neutered and grows bigger and stronger, Cupid will join Phoenix and Casey, two young Holstein steers rescued by Farm Sanctuary last January, when they were only hours old and bound for a slaughterhouse. A video of their harrowing rescue and the sad reality faced by other calves discarded by the dairy industry in California can be found at http://www.farmsanctuary.org. Note: Photos of Cupid available upon request. Farm Sanctuary is the nation’s leading farm animal protection organization. Since incorporating in 1986, Farm Sanctuary has worked to expose and stop cruel practices of the “food animal” industry through research and investigations, legal and institutional reforms, public awareness projects, youth education, and direct rescue and refuge efforts. Farm Sanctuary shelters in Watkins Glen, N.Y., and Orland, Calif., provide lifelong care for hundreds of rescued animals, who have become ambassadors for farm animals everywhere by educating visitors about the realities of factory farming. 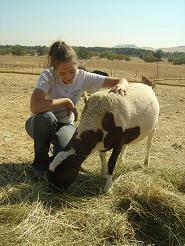 Additional information can be found at http://www.farmsanctuary.org or by calling 607-583-2225. I’m so glad he found he was way to FS. Can you post some pics of him?